Rockstar has been quiet on whether Red Dead Redemption 2 will be coming to PC or not. Luckily for us, a developer has accidentally let it slip on LinkedIn. The developer, who we will keep nameless, previously worked on GTA V and L.A. Noire as a programmer. We’ve looked into them to verify this. Rockstar previously released GTA V towards the end of a console generation without any word on a PC version. The PC version only came when the new consoles launched and the company released an upgraded edition. This tactic really worked for Rockstar and the company sold far more copies of the game as a result. We wouldn’t be surprised if that’s the same tactic being used here. For more on the upcoming Western, here’s how Bank Robberies and Gang Hideouts will only be available in the Special Edition of Red Dead Redemption 2. If you’re looking for more, here’s everything you need to know about Red Dead Redemption 2. Will you be holding out for Red Dead Redemption 2 on PC? Update: Since posting this story, we’ve been contacted by TGFG, the Rockstar community who hunt Easter Eggs in GTA V, who say they broke this news last night. The group were previously responsible for uncovering the alien mysteries of Mt. Chilead. We came by the information through a separate source, but thought it was only fair to link out to them since they beat us to the punch. 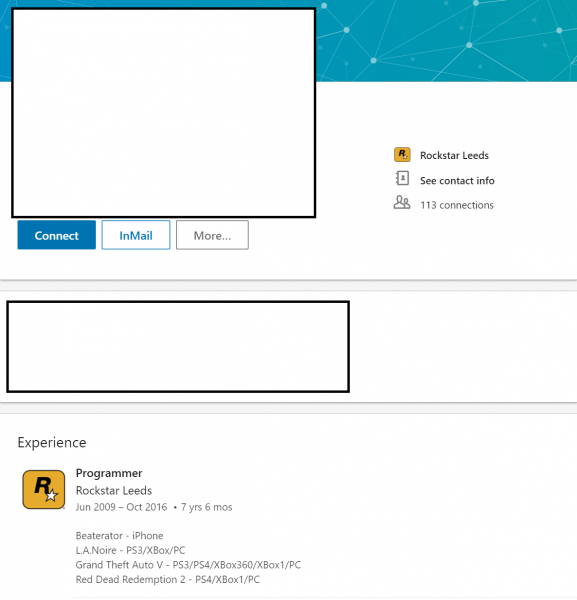 Update 2: The programmer has now removed mention of PC from their LinkedIn profile, likely prompted by the attention it’s been getting.